Rose Quartz Crystal Area looking East. 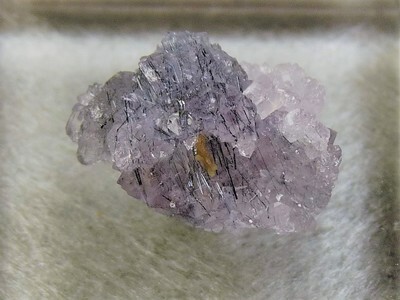 Granite pegmatite. Plumbago-Puzzle Mt., summit ridge. 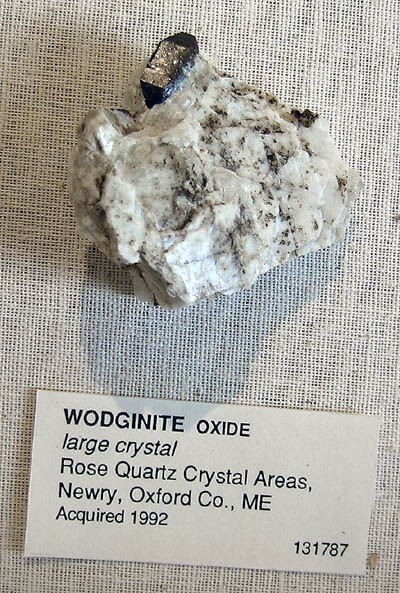 - Oxford pegmatite field. 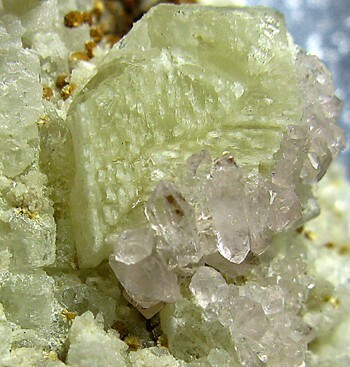 The first Rose Quartz crystals known in the world were found at Mount Mica Quarry about 1913-1915. 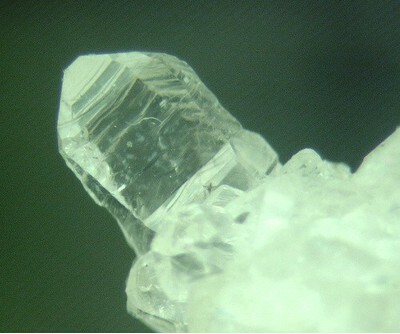 The second locality for genuine rose quartz crystals in the world, the Dunton Gem Quarry, Newry, produced its first crystals in 1927. A third world locality was discovered in 1942, at the Rose Quartz Crystal locality, by George Crooker. 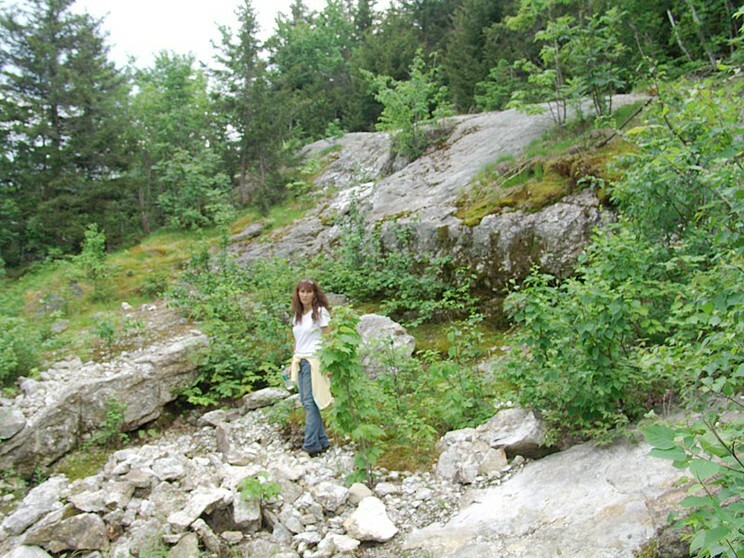 Rose Quartz crystals were found at the Nevel Quarry, Newry and in the Red Hill Quarry Group, Rumford, Maine in 1949. Rose Quartz crystals were not known in Brazil until 1958. (Note: This site is located near the Broome and Whitehall #1 and #2 prospects.) Pegmatite 24 is exposed over a vast area of southern Plumbago-Puzzle Mountain and many prospects have been dug into it. 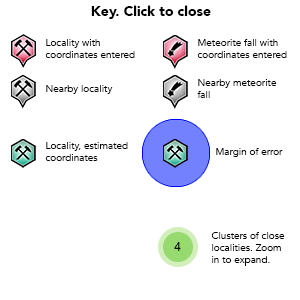 The species list includes all of those tiny, closely spaced exposures, although most of the reported species come from the Rose Quartz Crystal Locality. Reference: King, V. and Foord, E., 1994, Mineralogy of Maine, v. 1; King, V, 2006, Minerals of Halls Ridge and Plumbago-Puzzle Mountain, Newry, Oxford County, Maine, Mineral News, v. 22 (6), p. 1-3. 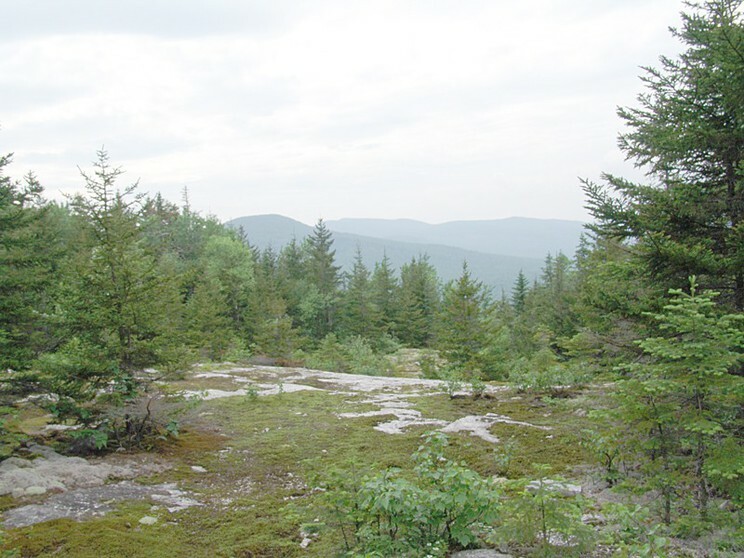 Reference: King, V. T., 1994, Mineralogy of Maine, Descriptive Mineralogy, v. 1; King, V, 2006, Minerals of Halls Ridge and Plumbago-Puzzle Mountain, Newry, Oxford County, Maine, Mineral News, v. 22 (6), p. 1-3. 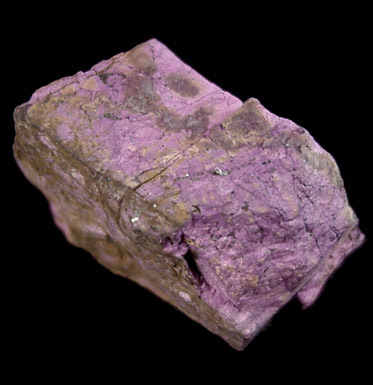 Description: Parent triphylite has Mn/Mn + Fe = 0.29 (Moore, 2000). Reference: King, V. and Foord, E., 1994, Mineralogy of Maine, V. 1 King, V. (ed), 2000, Mineralogy of Maine, V. 2 Moore, P. B., 2000, Analyses of Primary Phosphates from Pegmatites in Maine and Other Localities, in V. T. King (editor), Mineralogy of Maine. Mining History, Gems, and Geology, Maine Geological Survey, Augusta, Maine, p. 333-336. 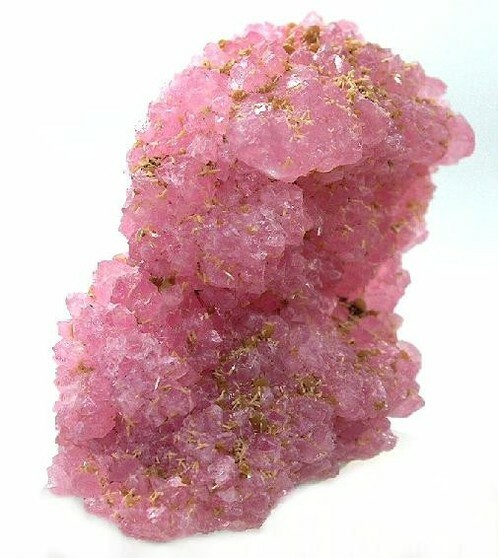 Description: Individual rose quartz crystals to over 2.5 cm have been found at this location with eosphorite crystals, montebrasite crystals, and other phosphates on albite crystal matrix. Groups of Rose Quartz Crystals to over 10 x 10 cm have been discovered. Reference: King, V, 2006, Minerals of Halls Ridge and Plumbago-Puzzle Mountain, Newry, Oxford County, Maine, Mineral News, v. 22 (6), p. 1-3. 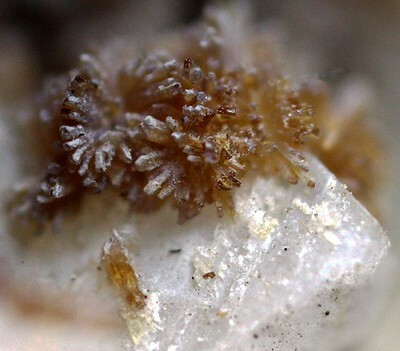 Description: Triphylite from this locality has Mn/Mn + Fe = 0.29 (Moore, 2000). Reference: "Mineralogy of Maine, Vol. 1" by King, V.T. & Foord, E.E., Maine Geological Survey, 1994 Moore, P. B., 2000, Analyses of Primary Phosphates from Pegmatites in Maine and Other Localities, in V. T. King (editor), Mineralogy of Maine. Mining History, Gems, and Geology, Maine Geological Survey, Augusta, Maine, p. 333-336. Moore, P. B. (2000), Analyses of Primary Phosphates from Pegmatites in Maine and Other Localities, in V. T. King (editor), Mineralogy of Maine. Mining History, Gems, and Geology, Maine Geological Survey, Augusta, Maine, p. 333-336.